This week, while Congress is home on recess, individuals across the country are speaking out at townhall meetings about the need to protect the Affordable Care Act. You may have heard the numbers: If the ACA is repealed, approximately 30 million individuals could lose their health care coverage. But one number you may not have heard is that ACA repeal would also result in the loss of 1.2 million jobs. That’s because if families are forced to spend more out of pocket for health care, they’ll have less money to spend on other basic necessities like food and rent. Fewer dollars spent at grocery stores and other businesses means fewer jobs. Every state would lose jobs if the ACA is repealed. Check out EPI’s interactive map to see how many jobs would be lost in your state. How would repealing the ACA affect your state? ACA repeal would cut federal spending nationwide by roughly $109 billion in 2019 and taxes by roughly $70 billion in 2019. Benefit cuts would negatively impact cash-constrained households, while tax cuts will disproportionally go to high-income households. States that will be most negatively impacted by the repeal of the ACA are those who have expanded spending (and thus will lose that expansion). The top 15 job-losing states, as measured by jobs lost as a share of both the total employment and the share of residents under age 65, are Arizona, Colorado, Kentucky, Louisiana, Maryland, Montana, Nevada, New Jersey, New Mexico, North Carolina, Oregon, Rhode Island, Vermont, Washington, and West Virginia. 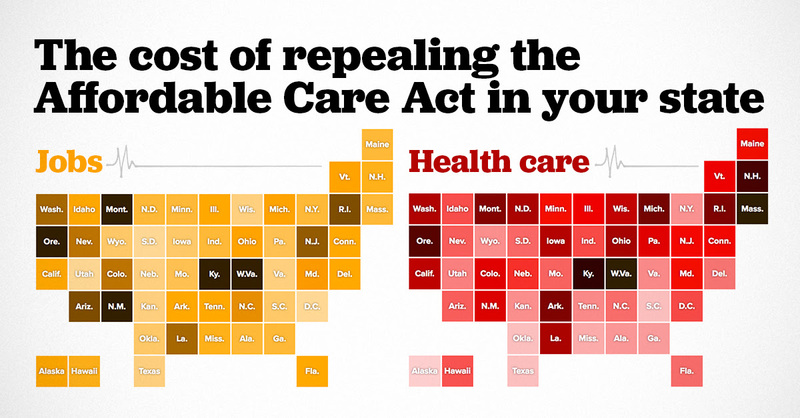 Click here to see how many jobs will be lost in your state if the ACA is repealed. Please let your elected official know that repealing the Affordable Care Act would be devastating for the residents of your state, costing them health and financial security as well as jobs. Last Friday, hours before signing an executive order that put the Dodd-Frank financial reform law on the chopping block, President Trump name-checked Chase CEO Jamie Dimon. “There’s nobody better to tell me about Dodd-Frank than Jamie,” he said. Translation: there’s no one better than Dimon to help gut Dodd-Frank. Chase has for years aggressively lobbied members of Congress to undermine financial reform. Now that Trump has packed his administration with Wall Street fat cats — including six Goldman Sachs alums — the table is set for a return to the pre-recession days when Wall Street wrote its own rules. We know how well that worked out. Banks’ systematic peddling of toxic loans brought down the U.S. economy, wiping out an estimated $19.2 trillion in household wealth and 8.8 million jobs. Losses were especially devastating for people of color, whose neighborhoods were targeted by predatory mortgage lenders. Researchers at Brandeis University found half the collective wealth of African-Americans and more than two-thirds for Latinos stripped away. Dodd-Frank was intended to protect people from discriminatory financial abuse and to prevent recurrent financial collapse. It imposed vital restrictions on risky derivatives, required that banks hold more capital to withstand shocks and authorized the government to liquidate the largest banks in the event of grave failures. Perhaps most important, Dodd-Frank put a much-needed consumer cop on the beat. Since its inception in 2011, the Consumer Financial Protection Bureau has returned $11.7 billion to 29 million consumers cheated by financial services companies. Through enforcement actions, the agency has protected people from discriminatory lending, abusive debt collection, deceptive marketing, unfair billing and much more. If anything, Dodd-Frank does not go far enough, especially when it comes to addressing systemic risk. As the financial reform bill moved through Congress, industry lobbyists worked to kill it line by line. The four too-big-to-fail banks that received the most bailout money from taxpayers are bigger now than they were before. Stopping Trump’s economic agenda will mean standing up to powerful interests that have plenty to gain from decimating Dodd-Frank. New Yorkers must urge their members of Congress to oppose them, and Trump, at all costs. But local action is also needed to ensure that these same powerful forces do not threaten New York’s consumer protections. While Trump takes a hatchet to federal financial reform, a handful of Albany legislators is poised to open the floodgates to predatory lending in New York. Last month, East Harlem Assemblyman Robert Rodriguez reintroduced the Community Financial Services Access and Modernization Act. The bill is merely the check-cashing industry’s latest attempt to legalize usurious lending. It would allow New York check cashers to make high-cost loans, with no underwriting requirements, to mom-and-pop, family- and immigrant-owned businesses . Sound familiar? In the state Senate, members of the Independent Democratic Conference, which caucuses with the Republicans, have advanced this and similar bills in the past. If New York’s legislators are serious about ensuring access to affordable loans in underserved neighborhoods, they should support community development financial institutions, including low-income credit unions, which have a track record and mission of serving immigrants, small businesses, and communities that banks have long failed adequately to serve. In 2007, New York established a fund for CDFIs, modeled after the federal CDFI Fund, which provides loans, grants, and investments in support of community development. New York has yet to allocate actual dollars to this state program. Given threats to the CFPB and to financial reform more generally, Gov. Cuomo should amend his proposed budget to breathe life into the state CDFI Fund, and send a clear signal that the check-casher bill is a non-starter. Resisting Trump’s economic agenda will not be easy. Yes, it will mean fiercely defending Dodd-Frank and the CFPB. But it will also mean pushing New York’s electeds to support solutions grounded in economic and racial justice. Establishing a robust state CDFI Fund is an obvious place to start. Morrison is the campaigns coordinator for New Economy Project. ANN ARBOR, Mich. – The Healthy Michigan Plan is living up to its name when it comes to the financial well-being of the state's hospitals, according to a new study from the University of Michigan's Ross School of Business. The report found that uncompensated care, which includes both charity care given to uninsured patients without the means to pay, and bad debt from insured patients who can't pay their high deductibles, has dropped by nearly 50 percent since the Medicaid expansion in 2014. Study co-author Tom Buchmueller says the change is particularly noteworthy given that many insurers have raised deductibles. "That change in the insurance market is pushing in the direction of more uncompensated care, which makes the impact of the Healthy Michigan Plan all the more impressive," Buchmueller points out. In 2013, the 88 hospitals in the study spent more than 5 percent of their budget on uncompensated care, absorbing $627 million in costs, but by 2015 the amount was down to $327 million, according to the report. Buchmueller says both hospitals and households across the state stand to lose ground if the covered expansions are rolled back, adding that right now, both are reaping the benefits of an improved bottom line. "You take away the stress of knowing that you're one medical event away from financial catastrophe and that gives you peace of mind, and there's a tangible mental health benefit there," he states. About 646,000 low-income residents participate in the Healthy Michigan Plan, which is supported by state and federal funds under the Affordable Care Act.